This game is a small school project where the experience had to be 10 minutes long and had to be a Shmup and had to include a scrolling mechanic. Also, the team was pick randomly in order to know each other better. Geamana is a 2.5D Shoot-them-up my team (The Clémenteam) and I made in about 4 actual weeks of work. 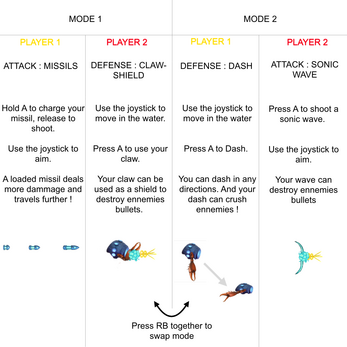 It's a 2 player game, where you need to cooperate in controlling the same avatar in order to survive : 1 player shoots and the other moves the avatar and can use the shield. Both player can switch position whenever (similar to Mario Kart Double Dash). In opposition to most other shmups, we wanted to put the emphasis on the atmosphere with great music, inspired by the Dark Souls franchise, and great graphics. Since the game is in french, the full tutorial in english is attached as one of the screenshots.